The convener of the #BringBackOurGirls group, Oby Ezekwesili, has been arrested by the police for unknown offences alongside some members of the BBOG group. 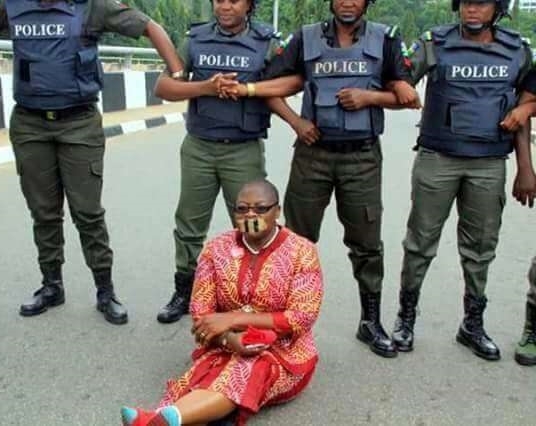 Co-leader of the Bring Back Our Girls (BBOG) movement, Oby Ezekwesili, has revealed on her Twitter account this Tuesday afternoon that some police officers deployed by the Inspector General of Police have illegally arrested and detained her as well as other members of the BBOG movement. The former Minister for Education alleged that it was President Muhammadu Buhari who instructed the IG of Police to detain her and other members of the BBOG group. 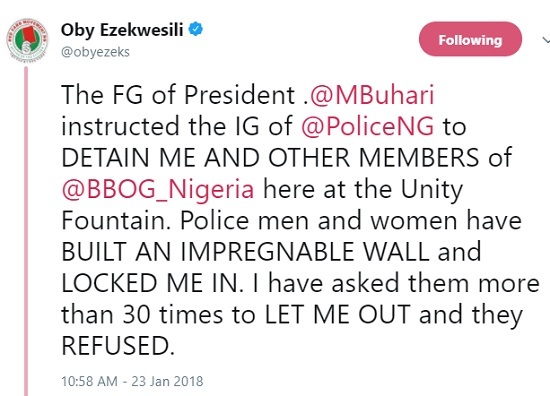 It was gathered from Oby Ezekwezili's tweets that she is being detained at the Unity Fountain, adding that police officers “built an impregnable wall” and “locked her in”. She stated that Officer Tina Ishaya, one of the police officers detaining her, refused to let her out of the wall. President @MBuhari The police officers deployed by IG of . @PoliceNG is VIOLATING my FREEDOM of MOVEMENT by LOCKING ME IN in broad day light at the Unity Fountain. THIS IS A DEMOCRACY. Officer Tina Ishaya just again REFUSED TO LET ME OUT OF THEIR WALL. President @MBuhari at your instruction, the IG of @PoliceNG CONTINUES TO DETAIN ME and HAVE ARRESTED SOME OF OUR MEMBERS. President . @MBuhari members of our BBOG Movement @BBOG_Nigeria HAVE BEEN ARRESTED BY OUR IG of .@PoliceNG . WE ARE ALL WAITING TO BE ARRESTED SINCE it has become an OFFENSE to DEMAND THAT YOU KEEP YOUR PROMISE TO RESCUE ALL OUR CHIBOKGIRLS. I've asked for our offense, no response. We are they taking us to, no response.